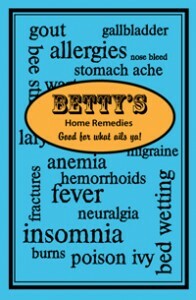 Betty’s Home Remedies is a unique book based on the author’s extensive knowledge or herbs and their medicinal properties. Written by Betty Aiken, now deceased, studied Herbology as well as Anatomy and Physiology, before eventually receiving Professional Status from the Ontario Herbalist Society. In 1991, she was honoured by being named the first OHS Herbal Healer. Betty had years of acquired knowledge of alternative remedies to common health problems. 72 PGS – 1/2 sheet size with illustrations. Perfect bound. Payment can be made directly by clicking the PayPal button below. Payment is processed through The Technology Centre. Interested in learning more about natural health remedies?